Please use our Maxwell-Bonnell-Calculator to convert actual temperatures (ACT) into athmospheric equivalent temperatures (AET) and to determine the pressure needed in the system so that AET corresponds to the ACT. 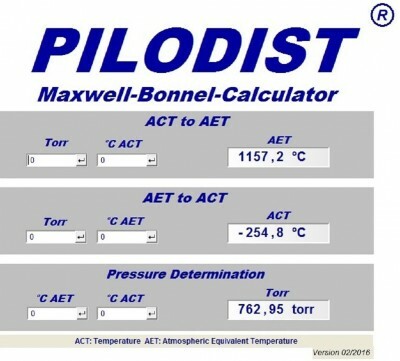 The Maxwell-Bonnell Calculator determines the atmospheric equivalent temperature (AET) from the observed vapor temperature (ACT) in the distillation system under vacuum. The Calculator is also capable to determine the observed vapor temperature (ACT) in case the atmospheric equivalent temperature (AET) and the pressure are known. With the new feature the Maxwell-Bonnell calculator is provided with an additional pressure determination. By entering an AET and an ACT, the user can now determine the pressure needed in the system so that AET corresponds to the ACT.